Founded in 600 BC, the city of Constanţa (historically known as “Tomis”) is the oldest continually inhabited city in Romania. Its port is the largest on the Black Sea and one of the most capacious in Europe. The city’s coastline is guarded by the empty Cazinoul din Constanţa, a rare and eye-catching example of Romanian Art Nouveau design. One hundred years ago this former casino was Romania’s most magnificent building, hosting world leaders and Europe’s elite. It survived two bombings during two world wars before gambling laws extirpated its profitability. The building was later forced into civic duty, which it served until it eventually closed in 1990. Attempts to renovate the waterfront site have been defeated by a financial crisis, delicate renovation constraints, gambling restrictions, and political indecision. Meanwhile, the estimate to repair the building grows. Will this Romanian treasure be saved before it succumbs to vandals and the elements? The Romanian municipality of Constanţa is located along the western coast of the Black Sea. Almost 300,000 people live in the country’s largest waterfront city; in the summer, warm weather and wide beaches draw crowds that nearly double that number. Before the current structure was erected in Constanţa, the site was home to an earlier iteration of a public recreational hall. 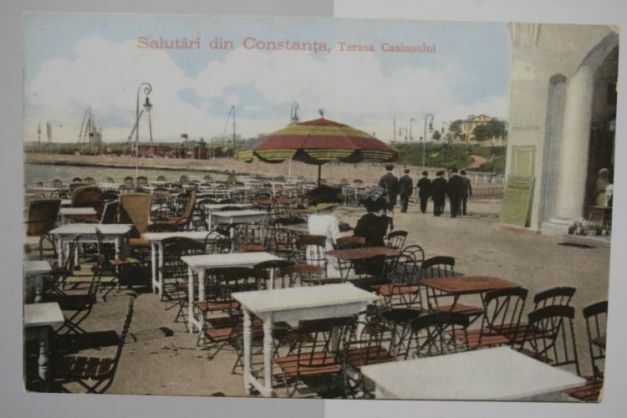 In 1880 the city opened the waterfront Casino of Constanţa Kursaalul. This wood-frame casino and recreational hall was the first building constructed on Romanian shoreline after Ottoman rule. From 1880 until 1891 the “Kursaal” (German word for public hall or building) hosted balls, theater, and other recreational activities. The gathering place was located next to the Genoese Lighthouse and contained a dance hall, two game rooms, and two lecture halls. However its most popular feature was the waterfront terrace, a favorite meeting place of tourists and European elite. Because it was forbidden for men and women to sunbathe together, the terrace was flanked by two sunbathing decks: Men on the left, women on the right. A storm during the winter of 1891 destroyed the roof and façade of the original wood-framed casino building, highlighting the need for more robust construction. In January of 1892 the municipal council approved the demolition of the original building, and by April the mayor organized a rebuild of the casino, which was completed in 1893. Constanţa Mayor Cristea Georgescu hired local resident and Swiss-born architect Daniel Renard to design a landmark casino. Renard was influenced by the Art Nouveau movement, a design philosophy largely in vogue throughout Europe at the turn of the century. He presented his first casino plans to city officials in 1905, however turmoil in local government would drag out the process for years. Constanţa’s new conservative Mayor, Ion Banescu, preferred traditionalism. Banescu jettisoned Renard and hired local architect Petre Antonescu to finish the design of the seafront casino, making sure it stuck to the classic internal layout of casinos. Antonescu found favor among the conservatives for his affinity for Romanian art and traditional undertones. In 1907 Georgescu was re-elected as Mayor and immediately reversed course on the casino. Antonescu was pulled from the job after the foundations had been poured, and Renard was re-installed to finish the task. Before the building was eventually finished three years later, its foundation was modified three times. In December of 1909 the city of Constanţa hired architects Ion Mincu and D. Maimarolu and engineer Elie Radu to evaluate the casino’s progress and confirm which plans would proceed; Renard’s design was approved. Construction began in 1907 and was mostly completed by July 24th, 1910. The casino opened in August of 1910, however the building’s finishing touches were not completed until 1912. When it was finished, it was the largest building of its kind in Romania. The cost to build was nearly seven times the estimate: 1,433,050 Lei (or €317,200). Hardwood furniture sat in front of beautifully decorated walls, illuminated by luxurious chandeliers throughout. Among the games played at the tables were cards, baccarat, roulette, and le jeu des petits chevaux. Local papers panned the asymmetrical casino because “in terms of architectural aesthetics, it leaves very much to be desired.” Another called the cazino “a monument erected in honor of incompetence and bad taste.” At the behest of local business owners, a restaurant building was added next door to the casino in 1912. During the 1914 visit of the Russian Imperial Family the casino hosted a royal gala. It was a landmark event, the first time King Carol I of Romania and Czar Nicholas II of Russia met on Romanian soil. 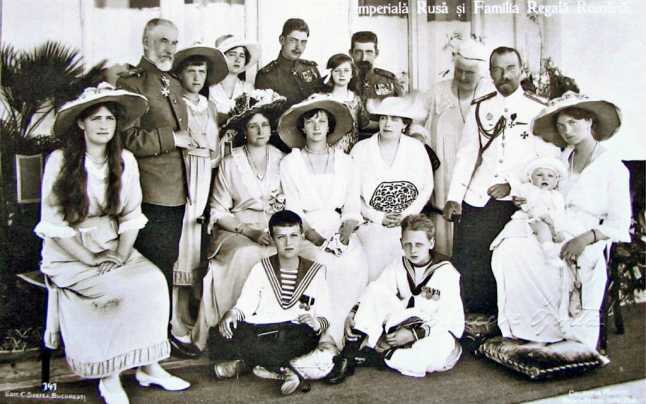 It was also the last visit abroad by the Russian Imperial Family. Talks between the dignitaries were diplomatic, however the proposed marriage of Grand Duchess Olga Nikolaevna and Prince Carol II fell through after the two failed to hit it off. Three weeks later Archduke Franz Ferdinand was assassinated in Sarajevo, sparking World War I. Both Nicholas II and the Grand Duchess were later imprisoned by Bolsheviks during the 1917 Russian Revolution, and killed the following year. Despite the initial negative press, the waterfront casino proved to be popular with wealthy European travelers. The casino operated successfully until 1916, when wartime needs during the First World War forced the casino into service as a military hospital. On August 20th, 1916 the casino – at the time serving as a hospital – was bombarded by German aircraft during an attack on Constanţa. The floor and roof of the building were destroyed, and ten people in the makeshift Red Cross hospital died from shrapnel wounds. On November 19th, 1917, the casino returned to casino duty, albeit in a smaller capacity due to its existing damage from the bombing. Plans to rebuild the casino to its former glory were laid out in 1928, and in 1934 Daniel Renard was recalled to assist in the project. For the next twelve years, the Cazinoul din Constanţa was once again a favorite destination of sailors and tourists. During World War II the recently rebuilt casino hosted German troops while temporarily serving as a military hospital. It was again seriously damaged after being bombed during an air raid. After the war, Soviet troops were accused of looting the building. In 1948 the House of Culture moved into the still-serviceable remains of the former casino. Three years later the casino was completely renovated, this time using political prisoner labor. Having survived two World Wars, the casino’s future appeared secure – but it was not to be. Ironically it wasn’t bombs that felled the Constanţa jewel, it was the anti-gambling laws introduced in post-war Romania. Suddenly the building’s ability to provide a reliable stream of income had been revoked, and its future no longer guaranteed. This uncertainty led preservationists on a campaign to declare the casino a national monument in 1956, and in 1979 the casino was submitted for inclusion on the list of historical monuments in the country (cataloged under the laws of the land, architectural monument, as noted in the List of Historical Monuments code LMI CT-II-mA-028 801, paragraph A of the code as representing the category of largest importance). During the gambling-free 1950s, the former casino housed a cinema and restaurant, and occasionally played host to city events. Dignitaries still made visits to Constanţa’s beachfront building into the 1960s, including Mohammad Reza Shah Pahlavi, former Shah of Iran. From 1960 until 1989 the Cazinoul din Constanţa belonged to Romania’s Board of Central Tourism (O.N.T. Litoral Mamaia), who operated the site as a tourist attraction until operating costs overwhelmed the under-funded agency. In 1986 the casino was renovated to include new décor and stained glass. New flooring, paneling, fixtures, and stained glass windows were installed. Some of what is left today that is not broken or otherwise destroyed are remains of this 1980’s renovation. In the late 1980s the restaurant building still found use hosting local council meetings. In 1990 the O.N.T. realigned itself, and as part of its streamlining process the tourism agency abdicated control of the casino building back to the city of Constanţa. Maintenance and operational costs eventually had become too burdensome for the agency, who abandoned the structure in 1990. In June of 2007 the city agreed to a 49-year lease of the former casino to Queenco Leisure International (QLI), an Israeli developer that specializes in renovating older buildings. At the time Queenco was operating two Greek casinos and one Serbian casino. The company was also working on a renovation in Bucharest of the Casino Palace. In exchange for development rights for the Constanţa casino, Queenco agreed to pay the city a royalty of €140,000 per year – as well as invest €10 million in revamping the beach surrounding the casino. Mayor Radu Mazare signed off on the deal, expecting a subsequent boost in tourism with redevelopment of such an important symbol in the city. In May of 2008 Queenco announced it would be investing €15 million into the former casino’s renovation. The developer hoped to finish the project by the end of 2009 in time to celebrate the casino’s 100th anniversary. French architect Christophe Herbert was tasked with restoring the main entrance, staircases, and terrace porches. In addition Herbert was to implement new chandeliers, furniture, and a lighting system. Then the financial crisis happened. In August of 2008 markets around the world crashed; development around the world ground to a halt and funding dried up as banks worldwide tightened lending. Compounding issues for Queenco was the legislation in Romania that restricted gambling, which reduced the site’s potential profitability and any return on investment. The market eventually recovered – and so did Queenco. However the relationship between the developer and Constanţa deteriorated after the group failed to invest the agreed-upon €10 million and meet its ongoing contractual payments schedule. In December of 2010 the city of Constanţa terminated its contract with Queenco under the claim the company “violated its contractual obligations.” Some parties involved posited the company would have continued investment in the site, if not for the law. In August of 2012 the city of Constanţa acknowledged it does not have the budget to properly restore the former casino. Rather than let the building fall to ruin, the city council agreed to donate the monument to the Romanian government, specifically the Compania Națională de Investiții S.A. (National Investment Company, CNI). Attached with the donation were strict conditions, including that if work does not being in a year’s time, ownership of the former building will return to the city of Constanţa. Citing budgetary shortfalls, the CNI was unable to make progress on restoring the former casino. It was later discovered there was money – but how it was spent came into question. Former minister of development Elena Udrea took particular exception with a €315,000 payment that, instead of restoring the casino, was used to pay for a Lady Gaga concert. In April of 2015 the casino was back in the hands of Constanţa, however a lack of funds resulted in another cooperation with the CNI in the fall of 2014. The National Investment Company auctioned the contracts for design, execution, and service of work. Due to the building’s significance, all architects, designers, and companies involved with the project must be certified by the Ministry of Culture. An optimistic Deputy Mayor predicted the symbol of Constanţa could have a new face as soon as 2018. In June of 2015 the CNI revealed additional information about the casino. Renovation estimates approached 32 million Leu (€7.08 million), however the National Investment Company believed work could begin by the spring of 2016. Plans called for a permanent ground-floor exhibition of the history of Constanţa, a conference room, and a café. Upstairs the auditorium would be refurbished, and the building would once again host dances and theater performances. Five companies reportedly submitted bids for the project during a June 29th auction in Bucharest. In April of 2016 two passionate citizens began an online petition to save the Casino of Constanţa. Art critic and director of the Art Museum of Constanta, Doina Pauleanu, believes the structure should be part of the “Seven wonders of Romania” list. The photos describe a beautiful calmness inside the former casino, but they fail to capture the smells – some of which are reportedly strong enough to elicit headaches. One visitor recounted an uncomfortable moment during his visit: “Right after setting foot inside the building, a pigeon fell from the railing at my feet, dead. Cats that were inside quickly ran to the pigeon, dragged it in to a corner, and ate it.” Morbid? Perhaps, but the casino’s legacy was not forged with broken glass and pigeon feces. Today it is still one of Romania’s most popular destinations for photographers and tourists alike. The former restaurant building now houses the first public aquarium in Romania. Most national and international events in Constanţa occur either in front of or inside the former casino. It is one of Romania’s last, oldest, and most unique examples of Art Nouveau. For Constanţa the casino remains an emblem, its silhouette synonymous with the city and Romanian architecture. For these reasons – as well as its unassailable importance to Romanian history – we can only hope the former cazino is rescued before it is lost forever. I lived in cta. for 6yrs. Been there a few times its beautiful and a tourist spot with cafe’s and a few vendor’s around. It also has a underground parking which is closed to public. Thank you Harsh, I appreciate the follow! What a coincidence you spent time in Constanta. It looks like a beautiful city and I’m genuinely surprised they haven’t been able to re-use the Cazinoul. I think it is one of the more handsome unrestored ruins I’ve seen. Absolutely stunning building. Hope they can save it. I agree Tom, thanks for the comment. ah yes this building is very famous in europe. we joke that man can’t take her down with bombs but can with legislation. the situation is not great for the building but she is still magnificent. great post thanks for picking such a nice example from romania. Cheers node, thanks for reading. If you have any other good European-based suggestions for a story let me know! Thankfully this place is not In the U.S.A. It probably would have been re-developed four times by now. Frank, this crossed my mind as well. You don’t often see waterfront property in U.S. tourist spots go undeveloped unless its Federal or State land. One exception I know of is the Coco Palms Hotel in Kauai. But latest news is that one is scheduled for redevelopment. Phenomenal photos & story. Thanks for sharing. Yes I agree, these photos are great. You would think the government could save the building if they were less restrictive to developers, or at least willing to change laws if it facilitates saving the casino. Hi Nick, I am sure there is more to the story than what I’ve written here. There must be, because I agree – if it was as ‘easy’ as being less restrictive or changing the law, surely they would have done so. Thanks for the comment! Must have been quite a beauty in its day. It still is amazing. Hope they can save it one way or another! Agreed Galen, I think it is still a very pretty building. Perhaps it is easier to appreciate the beauty now more than back then? Thanks for stopping by! I have a hard time believing this can’t be saved given its location and appearance. I am sure some ego is involved as well. There is probably some ego involved blurbex, I suspect you may be correct on that one. Thank you for reading! Another great article on someplace I never would have heard about otherwise. Always trying to bring attention to this (what I consider to be) under-viewed site. Thanks for your efforts! Cheers Rancid, I appreciate the kind words and share! Thanks for reading, my friend. A very interesting story of a relic and it’s checkered past. I do hope they can save this beautiful building. If nothing else perhaps some oil tycoon could make it their home and properly preserve it. I would like to see this in person. Thanks buddy, good to hear from you again. 🙂 No doubt, fingers are crossed this one gets saved! What a beautiful building! As usual a fascinating mix of old and new, past history when the building was ‘alive’ and present when it is dying. The dead pigeon and cats is a macabre detail! Cheers Alex, agreed on those details being macabre. Thanks for the comment! I’ve been there few times, and it’s painful to see the building left in that state. Too many political and commercial interests involved… the whole area of old peninsula of Constanta city is a marvel in itself, but a ruin, augmented with bits of unfinished buildings. You also may check Buzludza memorial, in Bulgaria – been there, also. Thanks for your post. A most interesting site! Thanks for the comment Sorin. It is a pity with all the political involvement. Also thank you very much for the suggestion about the Buzludza, I just checked it out and it looks fascinating! I’ll definitely add that one to the list, thank you my friend. Cheers! Very interesting use of an obscure place. I knew it was a high budget video but was very surprised in the end to see who made it. A bit too many balls towards the end but an effective presentation. Someone very creative discovered a location never seen before by 99.9% of the world. Excellent! Oh wow, what a video. We are able to see the Cazino up close in a higher quality than before. I laughed that they included the startled pigeon flying away during the balloon explosions. Neat video, thanks for sharing Ania! And right on Larry – great use by Sony of a not-so-well-known place. Wow, how I would love to experience seeing this building in person. Amazing; fine writing and research as always! Thank you for the lovely comment Cynthia, cheers!